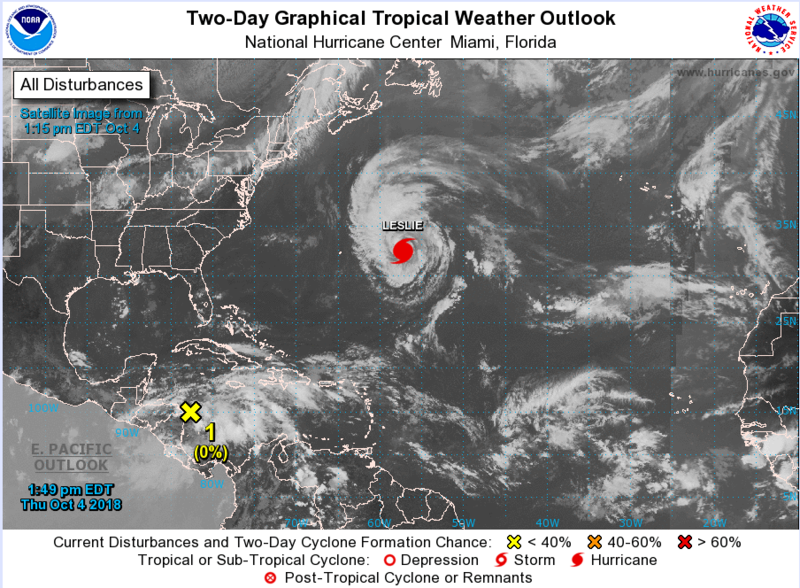 If tropical depressions eight and nine become tropical storms at the same time, how will the National Hurricane Center decide which system gets which name? Since Tropical Depression Nine is more likely to wind up as a named storm that will be retired next year versus tropical depression eight near the Cabo Verde Islands, do you think Tropical Depression Nine would become Helene and Tropical Depression Eight becomes Issac since right now Tropical Depression Eight is likely to be a fish storm and the World Meteorological Association can avoid having to come up a replacement name for yet another I named storm in 2019 since the World Meteorological Association is running out of I names? disorganized showers and thunderstorms between Cuba and Honduras. the western Gulf of Mexico Wednesday through Friday. There could be 5 named storms by the end of this week. I just want one ride with them. 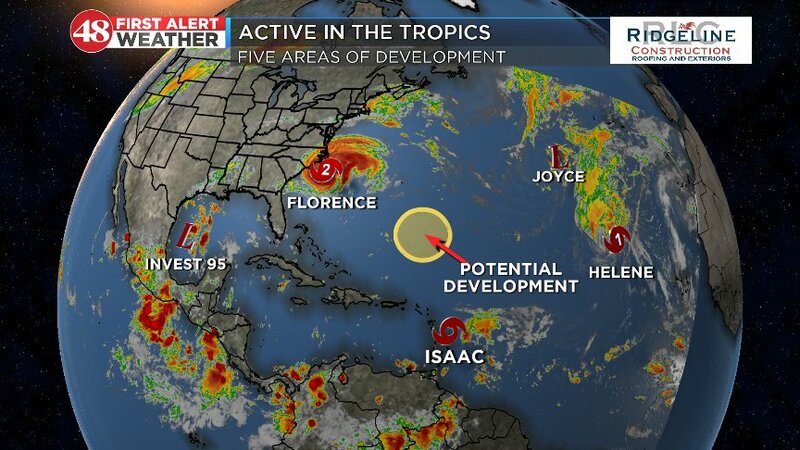 Looks like we may hit a lull after Florence as Isaac has officially transitioned to a remnant low and Joyce and Helene are meandering their way towards Europe. There's still some time, but the Cape Verde window may be closing for the season within the next two or so weeks before we move further W to the Caribbean and Gulf being our hotspots. Those can produce some nasty ones though (Matthew, Wilma), so we are not anywhere close to out of the woods yet even if the Cape Verde window closes. The Atlantic decided to take a week off after Florence but she is awakening with a vengeance including another potential Cape Verde system that's at a more typical latitude than Florence was. This could bear watching over the next week or so. Also the two systems off the east coast are bizzare. I think the red one is technically the remnant low of Florence so I don't know what the process is for naming that if it indeed is Florence's remains and it become a TC again. actually, I think it is the yellow x that is some sort of Florence remnant. IIRC, this was even predicted by some of the models leading up to landfall. I'd have to go back through the thread to see for sure. 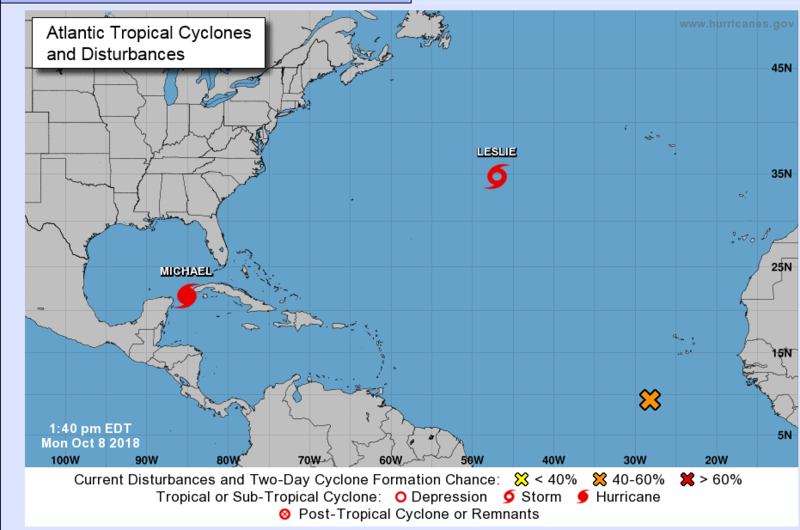 Subtropical storm Leslie is not a threat to land at this time. Indications of lowering pressures in the Caribbean in the 5-10 day range with Euro/CMC ensembles. Some pretty significant troughing developing over the Central U.S. will probably will whatever forms down there into the Gulf. At the very least, it looks like a surge of tropical moisture in the 5-10+ day period. I’m with ya! I see it too. Thunderstorm activity is pretty active down there. We may have a named system by the end of this week, and like you said, the pattern appears to support a track into the Gulf! Of course. I'm sailing out of Mobile next week. NO! GO AWAY! We are sailing from Mobile on Thursday. Need this to dissipate. 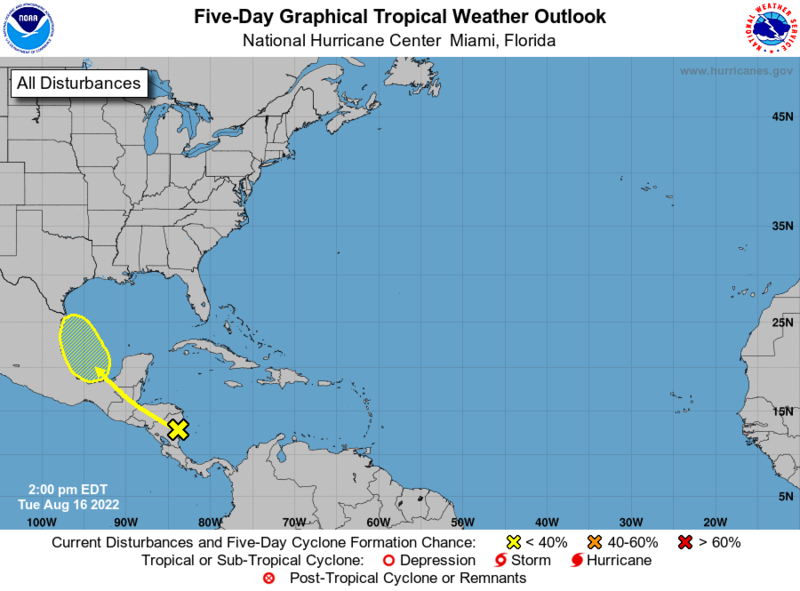 The only reason I'm taking this cruise is that we didn't make it to Cozumel in late May/early June thanks to Tropical Storm Alberto. Pretty good chance we will be dealing with a tropical system in the Gulf in October. The signs have been here for a while now. Please come into my backyard like I’ve seen some model runs do with it. Poor Leslie. It has been 16 days since her initial advisory and is now a Cat 1 Hurricane yet she never merited a thread of her own. She might get one if she gets close to breaking the longevity record. She's the Atlantic's answer to John in the Pacific in '87: do nothing but do it for a really really long time.